Fun day! The weather has been kind to us for the entire summer, and Newfoundland has been no exception. We set out for Grand Falls originally, but ended up riding more, and stopping more than planned, but all for good reasons. First we had lunch in Badger with Brad, Ariel, Kajsa and Alex, on their way west across the island to spend a few days in Gros Morne. We had initially kept a spare day in our back pocket to potentially do a trip up that way, but most of the scenery we would want to experience would require either a hike or a boat ride, while the riding would be much of the same as the rest of the west coast of the island. Instead we'll keep that spare day for chillin in Gander. After lunch we came across Paul and his girlfriend on their way east across the island, after he competed in a cycling race over the weekend. They had a ton of snacks for us, and it was sweet to catch up, though too short. We'll get plenty more chance in Gander. 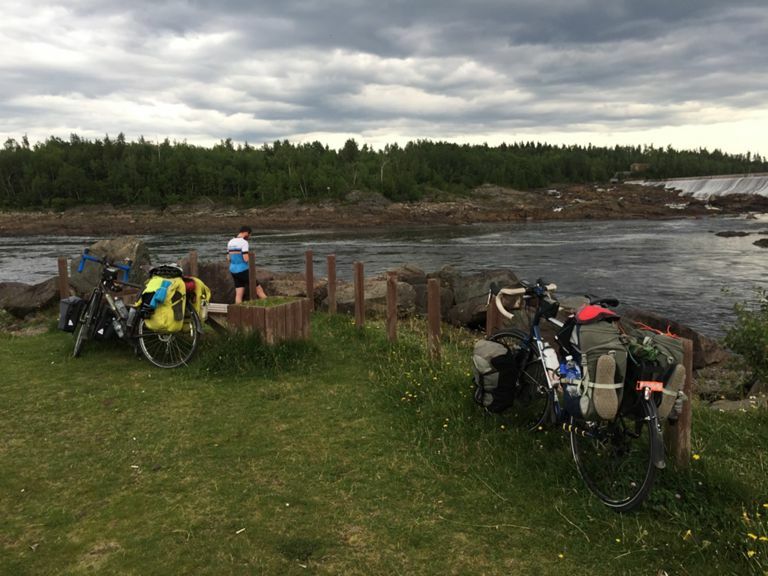 Finally, we had made good time and felt pretty good, so me made a dent in tomorrow's ride by passing through Grand Falls to spend the night in Bishop's Falls. We're camping near a hydroelectric dam, which also happens to be an incredible white noise generator. I expect a solid snooze.